Indeed it is a great favour and blessing from Allah that He has made for His righteous servants periods of time within which they can increase in good deeds to attaingreat rewards and one of these opportunistic periods is the first ten days of Dhul-Hijjah (the final month of the Islamic Calendar, in which the hajj is performed). The excellence of these ten days have been mentioned in the Qur'ân and the Sunnah. Ibn Kathîr said that "the ten nights" referred to here are the ten days of Dhul-Hijjah, and this opinion was also held by Ibn Abbâs, Ibn az-Zubair, Mujâhid and others. Ibn Abbâs and Ibn Kathîr said this means in the ten days of Dhul-Hijjah. "The most apparent reason for the ten days of Dhul-Hijjah being distinguished in excellence is due to the assembly of the greatest acts of worship in this period, i.e. 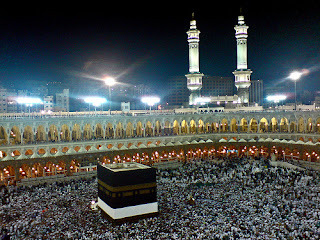 salawât (prayers), siyâm (fasting), sadaqah (charity) and the hajj (pilgrimage). In no other periods do these great deeds combine." WHAT ARE THE RECOMMENDED ACTS IN THESE DAYS? Al-Imâm an-Nawawî said that fasting in these ten days is extremely recommended. "So increase yourselves in saying lâ illaha illallah, allahu akbar and alhamdulillâh." "Ibn 'Umar and Abû Hurayrah, may Allah be pleased with them both, used to go out to the markets in the ten days saying the takbîr causing the people to follow them in this action." "Umar ibn al-Khattâb used to say the takbîr in his minaret in Mina, whereupon the people of the mosque hearing 'Umar, would start to say the takbîr as would the people in the markets until the whole of Mina was locked in glorifying Allah." Ibn 'Umar used to say the takbîr in Mina during these ten days and after prayers, whilst on his bed, in his tent, in his gathering and whilst walking. What is recommended is to say the takbîr aloud due to the fact that 'Umar ibn al-Khattâb, his son and Abû Hurayrah used to do likewise, may Allah be pleased with them all. Strive with us O Muslims in reviving this sunnah that has become lost in these times and it was almost forgotten, even amongst the people of righteousness and goodness all of which is unfortunately in opposition to what the best of generations were upon (preserving and maintaining the superogatory acts). - Allahu akbar, allahu akbar, allahu akbar kabîrun. - Allahu akbar, allahu akbar, lâ ilaha illallah, wallahu akbar, wallahu akbar, wa lillahil hamd. - Allahu akbar, allahu akbar, allahu akbar, lâ ilaha illallah, wallahu akbar, allahu akbar wa lillâhil hamd. However, whoever is at 'Arafah as a pilgrim then fasting is not expected of him, as the Prophet, peace be upon him, stopped at 'Arafah to eat.